When I saw this stunning bird in THIS Stacy Marks digikit, I fell in love. So I decided to make a very simple card where the bird was the main feature. I combined it with some lined paper from the larger kit HERE and embellished it with some yummy Hero Arts pearls. wow! your big bird is amazing, girl! so so beautiful! just made a card using this kit, too. but nothing close to this!!! great job singling out this fantastic-o bird! What a gorgeous card Lucy, so eye catching. Really pretty. I love the paper you used for the bird! WOW! This is so unique and beautiful! 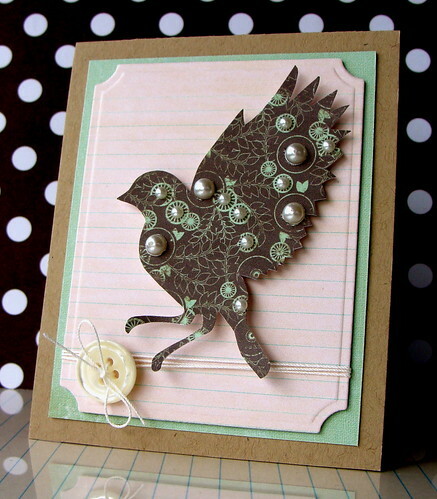 Love the pearls on the bird-great embellishing! This is stunning Lucy! The pearls are the perfect addition! Very dramatic and yet the bird is very elegant and graceful! The color is so bold against the lighter pink and blue shades, love it! 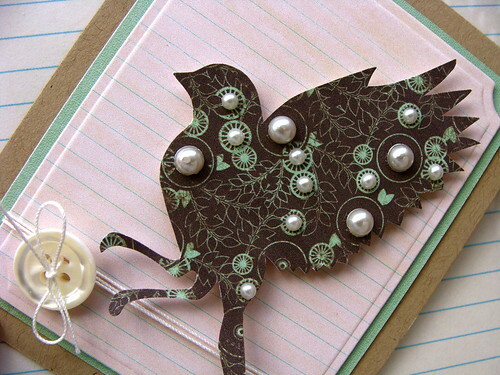 wow, I love the bird with wings proudly opened...so elegant..I like the way you make the card just like framing the picture. Wow Lucy- the bird is absolutely gorgeous and the pearls are just the right touch. I love cards with no sentiment on the front.....then you can decide on the inside what you want to say. LOVE it Lucy....a Gorgeous card!!! Wow Lucy, I've always been crazy about your work, but this is just STUNNING! My fave card yet! Yeah, ok, so this is AWESOME. I particularly love how it looks like the bird is going to land on the button. And his magical sparkly wings. Stunning! The pale background is perfect for this gorgeous bird. Your pearls are perfectly placed.